Jayden has a large selection of different cars and trucks that he plays with on a regular basis. He is like many boys that love to play with cars. 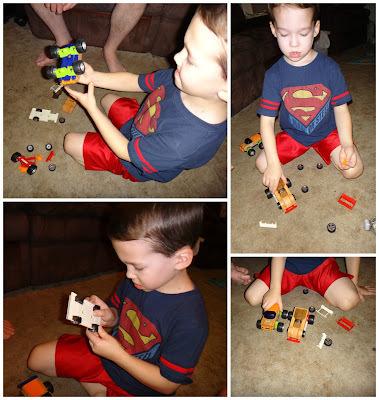 When I received a request to review the new Motorworks Customizable Wooden Toy Vehicles I of course said yes. I knew these would be fun for Jayden and my husband to play with together. Just the other night I pulled out the box I received and told Jayden I had something for him and daddy to play with. He of course got very excited to see what it was. Motorworks are customize-able wooden toy vehicles, accessories and play sets. There are three different series including Street Series, Speed Series, and Extreme Series. The vehicles are made with European Beech wood. They have convertible chassis that are designed for adding different accessories that easily snap-on to ad a customize look. Cabs, wheels, and rims are all interchangeable for fun customization. The wheels are fast rolling and smooth. We received the EXS Ground Effects Roadster and FSX Monster Truck along with the Downforce Dragster wheels and trip accessory kit. We opened up the Roadster first and Jayden immediately began to race it around. I told Jayden that he can change the car around. He was not sure what that meant until John pulled the pieces apart. John's first thought went to our last trip to California where John saw a store that you can build a car and he thought it would be great to be able to buy parts and let kids build their own cars at home. So John was very excited to see that someone else had the same idea. We used the Dragster wheels and trip accessory kit to change up the car. Jayden was hesitant to take the car apart and put new things on it. He did like changing the tires and matching up a different set. But when it came to the Monster truck he did not want to change it. He then asked his daddy to race cars with him. The Motorworks cars are fun and I really like that they are completely interchangeable. You can purchase different vehicles from the different series and they all work together. There are currently 9 different vehicles (3 in each series) and 7 different accessory packs to choose from. You can purchase a power pack of two cars or two trucks already together. I can see these vehicles becoming something that is a collection for kids. I'm sure Jayden would love to receive more of these vehicles and accessory kits. This makes a great option for gift giving. I learned they have interchangeable cabs, wheels and rims for even more customization! These are cool. I would love to have these for my grandson. I like the STS Police Cruiser 1.0™ and learned they have realistic wheels with removable rims! I like the FSX Monster Truck 1.0™! Fun! I like the FX Fire Chief 1.0! Look super fun! I like that the cabs, wheels, and rims are inter changable. I like the FSX Monster Truck 1.0! I can see little guy loving the Police pursuit accessories set! I really like that so much is interchangable... although it makes me wonder how easily it would be to lose pieces and parts! I like the GT Road Racer 1.0™. My son really likes the FX Fire Chief 1.0™ and so do I! I like the STX Patriot Dragster 1.0. I like the GT Road Racer.